It's a familiar story to every amateur astronomer: You set your telescope up outside before dusk to let it reach ambient temperature. Then you head inside to eat supper, relax, etc. When you go outside to use the telescope, however, you find your precision optics covered in dew. Your night observing is ruined! Dew is one problem that all amateur astronomers must face, regardless of their choice of telescope types. Refractors and compound telescopes are at the greatest disadvantage to dew because of their exposed glass surfaces. 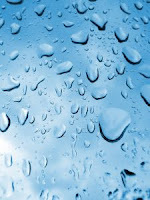 Reflectors typically do not have as much of a problem with dew on the primary (since it is deep inside the optical tube) but their secondary mirrors can experience dew problems. The following tips will help you win your fight against dew. In order to effectively combat dew, we first need to understand how it works. We've all heard reference to the "dew point" on the weather forecast. Dew occurs when the actual air temperature falls to this dew point. At the dew point, water condenses out of the air to form droplets. If the dew point is below freezing, frost forms instead of dew. These droplets like to form on your telescope optics and ruin your night observing. The reason dew chooses your telescope for a home, however, is radiation. Any object that has any heat in it will want to radiate that heat into its surroundings. In the case of a telescope, it will most likely be out under clear dark skies. The same clear dark sky you are observing is ironically the cause of the dew. One of the objects your telescope wants to radiate to is the dark sky. Being only a few degrees above 0 Kelvin, space is an excellent sink for radiative heat, and tends to pull the heat out of your 'scope. This causes it to fall below dew point and collect dew. The first and most inexpensive method of preventing dew formation is to block the heat's path to the dark sky. This is commonly done using a dew shield, like the one seen at left made by John Duchek at Cloudy Nights. The dew shield is a particularly useful tool for those with refractors or compound scopes having corrector plates. Dew shields can be purchased or made at home. If you don't want to spend a bunch of money on one, you can make one at home using just some flexible foam and a few other simple supplies. Basically, it is just a tube, about 1.5 times as long as its diameter. Click the picture of the dew shield at left for a tutorial on how to put together such a dew shield. Commercial dew heaters are also available from companies like Kendrick and Thousand Oaks that will gently heat your optics to just above the dew point, so dew does not form. While dew heaters can be an expensive solution, they work very well. They will almost entirely banish dew from your observing sessions, leaving you more time to actually use your telescope. If you don't want to spend any money, there are passive methods of preventing dew. One of these is to set up your telescope on higher ground, on top of a hill for example. Colder air tends to settle in low spots and will more likely be below dew point, so stay high and dry. Also, a slight breeze is helpful in preventing dew as it keeps the air mixed. For lack of a breeze, you can also use a small fan, much like the small fans mounted on some commercial Dobsonians and Newtonians. Even using a window fan can help to keep the air mixed. Telrads are also known for dewing up rapidly, so if you cover them with a tube of foam or similar, it will help to prevent dew. Covering objects so they can't see the dark sky is the most effective way of preventing dew, so put your finder's caps back on when your not using it, for example. To receive more articles like this, subscribe via RSS Feed or e-mail! Have any tips of your own? Leave them in a comment below! That's a great idea! I'll have to try that one next time I go out to observe! My Telrad is always the first thing that gets fogged up, so maybe rubber-banding a chemical handwarmer like the HotHands to it would keep it warm enough that it doesn't dew up. I've got a whole bunch of 'em laying around from last winter. Kind of like a cheap dew heater! They work best if you wrap them in something (thus the sock). Doesn't seem to work as well in the open air. I observe from the Everglades, so if I didn't use something I'd be lucky to get an hour and a half of observing in before everything dews up. Still haven't had a chance to try the hand-warmer trick... Its been mostly cloudy and (gasp) snowing here! Finally got to try the hand-warmer trick.. You can see the hand-warmer rubber banded to my Telrad in this picture. Note the comment previously had the wrong link. Cool! (or hot, um...) Glad it worked. I've been too cheap to buy a dew warmer system myself, plus I'm not ready to start hauling a battery around. I've been thinking of putting together a dew heater system with 1/4 watt resistors for the Telrad, that could be powered on a 9V battery inside the Telrad (since there's so much leftover room in there). I'll post pics if I do so. Yeah, I have been thinking about getting a 9v powered heater for my Obsession secondary mirror. It dews up once in a while. if anyone finds a 9v heating solution please let me know. I've been looking for one everywhere with no luck. I no nothing about electronics so i don't think i can make one myself. i shoot digital timelapse and a portable 9v heater would be the best solution as i have to travel and climb to remote places. the less i carry with the already heave equipment the better. and reach me at chris@visceralfilms.ca for any solutions or help.